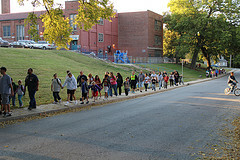 International Walk to School Day: Watch Out for Pedestrians and Bicyclists! October 8 is International Walk to School Day, a day when thousands of schools in the U.S. and in 40 countries strive to raise awareness about walking and bicycling to school. This day expresses the need for walkable communities throughout the world and encourages more children to walk to school. This day urges the need to educate the public about pedestrian safety. According to the National Highway Traffic Safety Administration, in 2012, car accidents resulted in the death of a pedestrian every two hours and an injury every seven minutes. In this same year, 4,743 pedestrians were killed and approximately 76,000 were injured in car accidents. The NHTSA defines a pedestrian as “a person on foot, walking, running, jogging, hiking, sitting or lying down who is involved in a motor vehicle traffic crash.” With that said, every single person is a pedestrian on a regular basis, whether it is a young child walking to school or an adult walking across a shopping mall parking lot. Our Florida Car Accident Injury Lawyers at Whittel & Melton work with families every day who have had their lives turned upside down because of a negligent driver who failed to pay attention to a biker or pedestrian sharing the roadway. Injuries to pedestrians struck by cars can vary from cuts, bruises and scrapes to broken bones, spinal cord trauma and death. Children under the age of 16 accounted for 6 percent of pedestrian deaths and 18 percent of pedestrian injuries caused by car accidents in 2012. In that same time period, pedestrians age 65 and older made up 20 percent of pedestrian deaths and 9 percent of pedestrian injuries as a result of auto accidents. Motor vehicle accidents involving pedestrians can be truly devastating. The NHTSA urges everyone to follow the below safety tips when walking or driving. Make sure that electronic devices do not interfere with sight or sound. Attempt to make eye contact with drivers as they approach, or make sure they are visible to drivers. Cross streets at intersections and crosswalks and walk facing traffic as drivers expect pedestrians to do these things. If there are no crosswalks, cross streets where there is good visibility so that you can be seen clearly by other drivers. Stay away from places where pedestrians are prohibited, like freeways and restricted-access highways. Avoid walking while intoxicated at any time. Keep an eye out for pedestrians, even in unexpected places. Be extra cautious when visibility is limited by inclement weather. Be prepared to stop at crosswalks and intersections. Refrain from driving under the influence of drugs or alcohol. Follow the designated speed limit, especially in areas with pedestrians. Observe reduced speed limits near schools, playgrounds and all other areas where children are known to gather. If you or someone you love has been involved in an auto accident as a pedestrian, it is important to be aware of your rights. A Florida Pedestrian Accident Lawyer at Whittel & Melton can help you understand all of your legal options. Please call us today toll-free at 866-608-5529 or contact us online for a free consultation about your case.